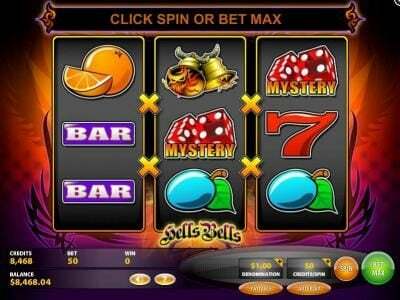 Hells Bells online slot machine pictures and slot feature list from Spielo, play Hells Bells Slots for free. Hells Bells Slots has not been reviewed yet, be the first to rate this slot. 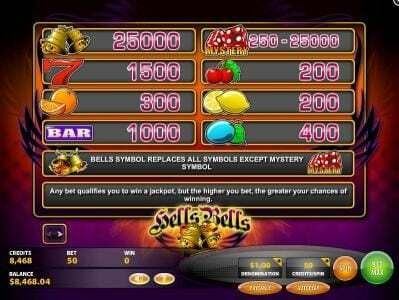 Hells Bells is a nice online video slot game that only has 3 reels and it features 27 different pay lines. The game is powered by GTech G2 software and it manages to offer an interesting set of features such as: a wild and scatter symbols. On top of that there is a very large jackpot that could real bring you some nice chances to win some massive prizes that are worth up to $25,000. The coin denomination starts from as little as $0.05 and go up to $1. This means that you could start playing the game and spin the reels with as little as $0.05 or place bets that are worth $50 for each spin. This slot game was introduced at the GTech G2 video slot games collection at the end of the year 2009 and it managed to become very popular, since it’s a nice mix between the classic and the modern video slot games. There are two different jackpots that are not progressive. The first jackpot is worth 500 coins, while the other is smaller and it will pay you only 30 coins. When you start playing the Hells Bells video slot game you will get the opportunity to see wild symbols. This means that you have some pretty good chances of getting more winning combinations. The wild will substitute any symbol that you need in order to have a complete winning combination. This is a classic online video slot game and this means that you will get to find only three reels and you can activate 27 different pay lines. This is a classic and the symbols are coming from a fruit machine. You can find the classic fruit slot symbols and on top of that there will be also bells, bars, red sevens and dices. If you are a big fan of the fruit machine this could be the excellent Online Casino game for you. If you just want to set up the bets levels and forget about clicking on the spin button, you can always use the auto-play feature. This feature will automatically spin the reels and give you the opportunity to win some massive prizes with absolutely no efforts. Another special thing about Hells Bells classic slot game is the gamble game. This way every time you land on a winning combination and you get to receive a payout, you can activate the gamble game. Your mission here is to guess whether the next card that is drawn randomly is a high/low or red/black. This simple game allows you to play your winnings and double your payouts. This is the type of game that is normally found at the video poker games and it allows you to increase your payouts, with the smallest risk, since the house edge is very small. You basically have 50/50 chances of winning. 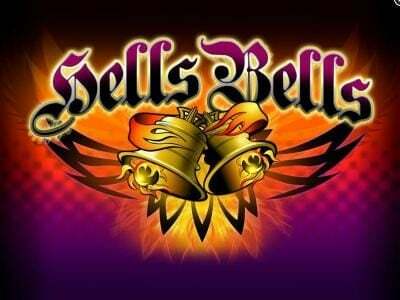 Overall Hells Bells is an excellent online Slot game that allows you to have a massive amount of fun and if you play it for long enough, you will eventually land on a big prize that will fill your pockets. The design is very simple and colorful.